Darjeeling Hill Road. Entrance to Pearson's Cutting, 3 miles below Kursiong. bl.uk > Online Gallery Home	> Online exhibitions	> Asia, Pacific and Africa Collections	> Darjeeling Hill Road. Entrance to Pearson's Cutting, 3 miles below Kursiong. 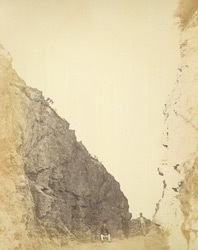 Photograph from the album of views depicting the Construction of the Darjeeling Hill Road taken by an unknown photographer in 1865. The road connecting Darjeeling with Siliguri on the plains was initiated in 1861 largely as a result of the sudden expansion of tea plantations in the mountains. Constructed and maintained by the Public Works Department, it was 48 miles long, 25 feet wide and cost around £6,000 per mile to build. The road was difficult to construct as seen here at Pearsons Cutting 3 miles below Kursiong, "a cutting had to be made in the face of a stupendous crag, a solid mass of rock about 500 feet in height and of the same breadth".